طواقم الانقاذ تواصل عملها لانقاذ مئات العائلات التي غرقت في المياه وتشردت من بيوتها في مناطق متعددة من قطاع غزة . مئات العائلات تغرق في المياه وتشرد من بيوتها في مناطق متعددة من قطاع غزة . December, 2013] The World Health Organisation (WHO) has expressed concerns over critical shortages in medical supplies and electricity for Gaza health services — shortages which are putting Palestinian patients’ lives directly at risk, the Alternative Information Center (AIC) has reported. In a recent press release, WHO notes that 30% of medicines and 50% of medical disposables are out of stock in Gaza’s central drug store. This means that patients are, too often, not receiving the appropriate kind or dosage of medicine. And, with daily electric outages averaging at 14 hours, in addition to the high cost of diesel fuel, generators supply only the most pressing of needs (e.g., intensive care units). The Gaza Strip has been under a severe economic blockade imposed by Israel, with Egyptian support, since 2006, causing surges in the price of diesel. In addition, the Egyptian grid which supplies power to Rafah and southern Khan Younis, in the south, was disconnected Saturday. The Gaza Strip Power Authority was unable to provide electricity to these areas, as a result. WHO reports that the accumulation of shortages in basic supplies for the Gaza Strip is leading to rapid deterioration in the social determinants of health for the population of 1.7 million Palestinians, and that it is straining the health system’s ability to provide a good standard of health care. The chronically ill, newborns, transplant recipients, the elderly, persons with disabilities, emergency patients, and the poor are most vulnerable. Also at risk are the mental and public health of the whole population, due to increasing stress and declining services. With 60, 000 births a year, Gaza’s health care needs are a growing concern. The Bankruptcy of the US Empire Displayed in a Keynote Address by US Secretary of State John Kerry to theSaban Forum. In the speech Dec. 7, 2013, Kerry described the US as “the honest broker”. However, in explaining his own record as just such an “honest broker”, he stated: “I have spent almost 30 years in the United States Senate, and I’m proud of my 100 percent voting record for Israel”. He talked about Mandela’s legacy: “The world is mourning the loss of a great leader right now, Nelson Mandela. Mandela was a stranger to hate” but then went on to say that, “The only way to secure Israel’s long-term future and security will be achieved through direct negotiations that separate Palestinians and Israelis” (this is APARTHEID, Mr. Kerry). He also described Palestinian Israelis as a “demographic time bomb” and an “existential threat to Israel”. And the Palestinian collaborators in Ramallah continue their futile journey to the abyss! In fact, their leader Mahmoud Abbas chose to declare in South Africa this week his opposition to the general boycott of Israel, even though it is similar to the boycott that brought down S. African Apartheid. 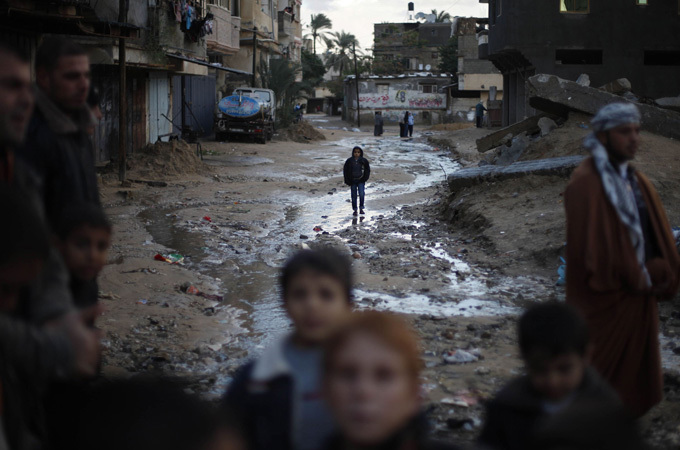 Thousands of Palestinians in Gaza have been displaced because of severe flooding. Two metal sheets fell from the ceiling of Bilal al-Riqib’s house on Tuesday evening, narrowly missing his wife and children. The power had already been cut when the house was struck by one of the worst storms Gaza has encountered in living memory, flooding large areas and displacing thousands of residents. The destruction led al-Riqib and his family — including his five-month-old baby — to seek shelter at a nearby school, though they now spend nights in a neighbor’s home. Located in Bani Suhaila, a town in southern Gaza, al-Riqib’s cottage-like home consists of two rooms. Al-Riqib, a 31-year-old unemployed construction worker, pointed to a children’s wardrobe that was wrecked by the storm. He had not yet fully paid for the piece of furniture. Al-Riqib has not had any income since July, when the Egyptian authorities destroyed numerous underground tunnels linking Egypt to Gaza. His business had depended on construction materials brought into the Strip via the tunnels. Approximately 100 persons from 16 families have taken refuge in the Ibn Zaidoun primary school in Bani Suhaila. Basim Qahwaji, a 46-year-old father, is among them, along with seven of his nine children. Their house has been flooded as a result of heavy rainfall. Mohammad Braim, a local authority official, said it had not yet been decided whether the 16 families should remain at the school or be sent somewhere else before lessons begin on Sunday morning. The Hamas-led administration in Gaza has estimated that as of Friday, 2,825 persons have been displaced due to what is being described locally as the most severe storm in the Strip since 1952 (“Widespread flooding in Gaza forces thousands to flee homes,” Ma’an News, 13 December). “Large swathes of northern Gaza are a disaster area with water as far as the eye can see,” Chris Gunness, spokesman for UNRWA, the UN agency for Palestine refugees, told Ma’an News Agency today. Despite these efforts, “the situation is dire and with the flood waters rising, the risk of water borne disease can only increase,” Gunness warned. The problems caused by the storm have been compounded by a power crisis that has left Gaza without electricity for between 12 and 16 hours per day, and sometimes longer, as well as the ongoing siege imposed by Israel. “Any normal community would struggle to recover from this disaster. But a community that has been subjected to one of the longest blockades in human history, whose public health system has been destroyed and where the risk of disease was already rife, must be freed from these man made constraints to deal with the impact of a natural calamity such as this,” Gunness added. Gunness renewed his agency’s call for “effective pressure to end the blockade of Gaza” that was exacerbating the crisis caused by the storm. A few days before the storm hit, the World Health Organization reported that there had been a marked deterioration in the availability of medicines and vital services in Gaza. Large generators for powering hospitals during electricity cuts have been encountering breakdowns. One of two generators at the European Gaza Hospital burned out in November. WHO also stated that publicly-run hospitals in Gaza have cut non-urgent surgeries by half in recent months in an attempt to keep scarce fuel for emergency procedures. More than 30 persons were injured during the storm, according to press reports. They included a five-year-old boy, hit by a rock which fell from a roof in the Khan Younis refugee camp in southern Gaza. The boy was rushed to hospital. Winter storm fells trees, damages buildings and injures dozens of people in densely populated Palestinian enclave. Severe flooding has forced dozens of families in the Palestinian Gaza Strip to leave their homes as a winter storm battered much of the Eastern Mediterranean. Some poorly built houses collapsed in the icy rain on Thursday, and many residents were seeking refuge in schools. The Health Ministry said more than 30 residents had been injured in car crashes and collapsed buildings. We need urgent intervention from the whole world to save our lives. Gaza’s 1.8 million people, governed by the Palestinian group Hamas, have already been enduring around 12 hours of blackouts daily since the lone power plant was switched off last month due to a fuel shortage. The enclave lies on the coast, sparing it the snow that has fallen across other parts of the region, but heavy rains felled trees and damaged nearly 200 homes. Locals built makeshift bridges across the torrents with bricks and wooden planks, while emergency workers plied flooded streets with heavy trucks and small fishing boats to whisk residents trapped by the freezing water to safety. One of the most densely populated tracts on Earth, Gaza lacks much basic civil infrastructure and lives under an Egyptian-Israeli blockade with the declared purpose to cut off arms flows, but also curbs imports of fuel, building supplies and basic goods. In parts of the occupied West Bank and in Jerusalem, many schools and offices were closed and public transport was briefly suspended. Thousands face imminent death due to lack of access to basic necessities during the civil war. Nine more children including 4 newborn babies died from the cold, the Syrian Network for Human Rights announced Friday. Doctors in the region warn that worsening weather conditions could lead to more deaths as the lack of access to basic necessities has left thousands facing imminent death. The Syrian opposition issued an urgent call for help to international institutions. The Middle Eastern nation braves the wintry cold for a third time during the civil war which began in March 2011. More than 100,000 people have been killed in the more than three-year old conflict in Syria and over two million Syrians are now registered as refugees in neighboring countries, Turkey. Lebanon and Iraq, according to the UN. 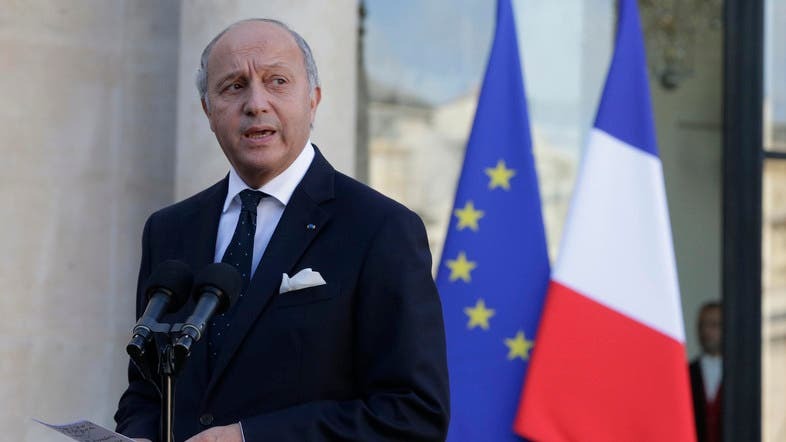 France’s Foreign Minister Laurent Fabius said on Saturday that the moderate opposition to the Syrian regime was in “serious difficulty” and that France is “pessimistic” about the success of a planned peace conference set for next month. “The moderate opposition that we support is in serious difficulty,” Fabius said in Monaco, according to Agence France-Presse. The minister also voiced “doubts” over the prospects of peace talks, known as Geneva 2. “In Syria, I am sadly quite pessimistic,” Laurent Fabius told delegates at the World Policy Conference in Monaco. “We are working on the success of [the Geneva talks] but we can have a great deal of doubt on that,” said the top French diplomat. Fabius said Syria’s moderate opposition, which Paris has supported, was in “great difficulty,” in reference to the Free Syrian Army and the Syrian National Coalition. Geneva 2 is currently set for Jan. 22. Syrian President Bashar al-Assad’s regime and opposition groups have stated their willingness to attend Geneva 2 peace talks, but they disagree on how the transition of power and the presence of officials from Iran and Saudi Arabia, which backs the rebels, at the talks. 14 December 2013 — We at the Palestinian Federation of Unions of University Professors and Employees (PFUUPE) warmly salute the National Council of the American Studies Association (ASA) in the United States for standing in solidarity with our struggle for freedom and justice in Palestine and endorsing a resolution for a boycott of Israeli academic institutions on December 4, 2013, following the widespread support for the boycott at the association’s annual meeting in Washington D.C.
We are deeply moved and inspired to hear that hundreds of ASA members attended sessions on Palestine and resoundingly applauded speaker after speaker who explained the moral and political imperative of boycotting Israel and its complicit institutions as a concrete contribution to ending its regime of occupation, settler colonialism and apartheid against the Palestinian people. We know that this support rising up from deep within the belly of the US empire broke the climate of fear and intimidation that was created by well-endowed Zionist organisations in the United States, and represents a powerful turning point for the Palestine solidarity movement in the US and worldwide. PFUUPE would like to commend the conscientious intellectuals who worked tirelessly to bring this resolution before the ASA’s National Council. We salute the courage and determination with which they confronted the virtual silence within the US academy, and faced the atmosphere of bullying produced by the Israeli state and its supporters. Furthermore, we applaud the commitment of these academics to stand with us as we oppose the Israel’s daily denial of our academic freedom in the context of its overall denial of our human rights, through systematic ethnic cleansing, dispossession and institutionalized racism. We Palestinians have long been expected to remain silent and “ignore if not celebrate (our) own oppression”. The ASA has broken a taboo. The ASA National Council’s unanimous endorsement of this resolution is “an ethical stance” that opposes this oppression. Its message is a resounding “no” to the impunity with which the Israeli state maintains its multi-tiered system of oppression against the Palestinian people. This resolution is a victory for our movement and its use of boycott as a form of civil resistance that seeks to isolate the Israeli state and its complicit institutions internationally, until Israel abides by international law and restores the rights of all of the Palestinian people, as outlined in the BDS call. As ASA members vote on this historic resolution, we would like to take this opportunity to address the members directly. Comrades and colleagues, by adopting this resolution you will be building on the important precedence set by the Association for Asian American Studies, leading the way in integrating BDS into the academy, and strengthening our movement worldview in the pursuit of freedom, justice and equal rights to all other humans. Israeli academic institutions are not only complicit by virtue of their silence in the face of the racist, colonial laws and policies of the Israeli state, but they are also intimately part of this infrastructure of oppression through their organic links to the Israeli military establishment and their ties to the occupation regime. Adopting the academic boycott is not only a position in solidarity with Palestinian rights but a position that defends academic freedom as well. The boycott upholds the right of individuals to critique the Israeli state’s illegal and racist policies without facing criminalization or punishment, and it upholds the right of individuals to “decline participation in sites of injustice.”  Furthermore, the boycott is institutional and ASA has already gone to lengths to explain how it does not work to restrict collaboration with individual scholars. Comrades, like your organisation, we affirm that the struggle against racism, war, corporatization of academia and disenfranchisement of communities of color in the United States and the struggle for freedom and justice in Palestine are interconnected. After all, your Congress, government and tax dollars are the main reasons why Israel can maintain its regime of oppression against us with such impunity. We remind you that in South Africa, the apartheid regime “died on the sharp edges of principles, struggle and solidarity, not forgiveness, apologetics and compromise.”  We firmly believe that it is only through principled international solidarity that contributes to bringing real pressure to bear on Israeli institutions that we can end their complicity in the oppression of our people. You have an opportunity to join us by ratifying this historic resolution that will make a significant contribution to the struggle for freedom and dignity for all Palestinians. Israel effectively boycotts Gaza produce by not giving access to their own markets. The Gaza Strip, now in its seventh year of a comprehensive siege by Israel, has faced increased hardships since the 3 July coup in neighboring Egypt. On 26 November, the United Nations’ Office for the Coordination of Humanitarian Affairs warned that the Palestinian enclave “is affected by one of the most serious energy crises in recent years, with potentially serious humanitarian ramifications” (“Gaza fuel crisis situation report”). Electrical blackouts have increased to as long as 16 hours per day, while fuel scarcity has affected the operations of all 291 water and wastewater treatment facilities, causing multiple sewage spills. Local supplies of vital medicines are low or empty, and Israeliattacks on Palestinian fishermen and farmers continue. Meanwhile hundreds of students and thousands of would-be travelers remain unable to leave or return through either the Erez checkpoint or the Rafah crossing. Tom Anderson and Therezia Cooper are the research team of Corporate Occupation, a project of Corporate Watch. Naming names, and going into detailed specifics, their blog documents the involvement of both international and Israeli companies in the illegal occupation of Palestine. The Electronic Intifada spoke to to the Anderson and Cooper earlier this year about being harassed by police under “anti-terror” law while returning to the UK from a previous research trip to the occupied West Bank. The Electronic Intifada contributor Joe Catron interviewed Anderson and Cooper on 5 December in Gaza City, shortly before the end of their visit. Joe Catron: You’ve been in Gaza for four and a half weeks. What’s was the focus of your research? Therezia Cooper: We wanted to research the impact of the siege, and the way Israel profits from it. Our research has been quite broad, and looked at all aspects of the strangulation of the economy and impacts the siege has on the ground. We’ve researched agriculture, exports from Gaza, the medical sector, prisoners, and effects of drone technology and other weaponry. Tom Anderson: Separate from research, we also wanted to provide information from people in Gaza that will be useful in BDS campaigns around the world. Many solidarity activists have a lot of contacts in the West Bank because of the relative ease of access. We wanted to make connections with Gaza activists to better inform solidarity campaigns, specifically the BDS movement. JC: What kinds of connections have you made with Gaza activists? TA: We’ve been encouraged by meeting people and hearing of their enthusiasm for BDS as a strategy, and that they feel it’s an important part of their struggle against the occupation. We’ve been asked to talk by many groups. We spoke about what the international BDS movement has been doing. People were eager to hear about successes. They were keen to have more feedback from the movement, more interaction and more Arabic materials on BDS. TC: Having all these meetings and making connections has been one of the most fruitful parts of our trip. The movement is growing a lot through interactions over the Internet, but going to meet people, having real-life contact, and talking is very important. JC: What new resources can BDS activists expect from your time here? TA: We focused on a few different areas. One was military technology used against Palestinians. Israeli arms companies are world leaders in drone technology. They’ve developed that technology in the context of the occupation. Their expertise, and the technology they’re now trying to sell internationally, has been gained through war crimes and repression. Israel has sold drone technology to up to 49 countries. The BDS movement needs to challenge Israel’s ability to profit from their experience oppressing the people of Palestine, impede their foreign sales of this technology, and target the offices and manufacturing facilities of [arms] companies like IAI [Israel Aerospace Industries] and Elbit, as well as their participation in international arms fairs. We’ve done interviews with people on the receiving end of this Israeli drone technology here in Gaza, speaking to people whose houses have been targeted, and many who’ve lost family members to Israeli drone strikes. Drones are now Israel’s weapon of choice against people in Gaza. Deaths from drone attacks exceeded those from other weapons during the last large-scale Israeli attack on Gaza, and were a large proportion in the previous one. We hope we we can provide resources to campaigners to target these companies’ abilities to make money out of experience they’ve gained supplying equipment used to commit war crimes. TC: We’ve also spent a lot of time doing research that can be used by the campaign against a company called G4S, which provides security systems for Israeli prisons. The campaign against G4S is possibly the fastest-growing BDS campaign in Europe, with a lot of groups working together to pressure G4S to withdraw from the contract they have with the Israeli Prison Service [IPS], among other things. We interviewed prisoners who had a range of different experiences in Israeli prisons, and experienced a lot of different mistreatment, including prisoners who have given birth in prison, people who have been denied proper medical care and detainees who have been forcibly relocated from the West Bank. Again, we think by coming here to hear the personal stories of people who have experienced the abuses of the IPS, we can benefit campaign work in the UK and around Europe. It’s hard for people in Gaza to boycott Israeli products, or have that kind of BDS campaign on the ground. But I think by telling stories of their experiences, they provide the backbone of the BDS movement and explain why it’s necessary, so we can work together to pressure these companies to end cooperation with Israel. TA: G4S makes its money from large contracts with the public sector. That’s its weakness. People around the world can pressure the public authorities giving those tenders not to give contracts to G4S until it ends its contracts with the IPS and Israeli checkpoints, settlements and the [Israeli occupation authorities in the West Bank]. It’s a good target for BDS campaigns, because a public campaign to prevent G4S from obtaining one of these tenders can cost them millions of pounds. TC: One of the biggest challenges that we’ve become even more aware of since getting here, is how the solidarity movement can help Palestinians achieve some kind of independent economy in addition to BDS. The struggle of the Palestinian economy is evident in everything you see, on every level, in Gaza. At the moment, it’s very difficult to find a way to support Palestinian exports. The devastating effects Israeli policies have on farmers are overwhelming them. Their main markets have been taken away. Even when they’re allowed to export tiny amounts of produce, they have no access to the local markets, in Israel and the West Bank, which used to sustain life in Gaza. TA: That’s part of a policy of economic warfare. Elements of the siege that seek to control Palestinian exports go hand-in-hand with policies like the targeting of Palestinian farmersand fishermen. They’re intended to devastate the economy, but also to create a compliant economy that Israel can control, and from which it can profit. Wherever we’ve talked about the boycott, they’ve asked us about ways the solidarity movement can support Palestinian exporters and help get Palestinian produce out of Gaza. That’s one area that could do with some creative thinking by the solidarity movement about how to support Palestinians by breaking the siege, by breaking Israeli control over Palestinian exports. I think one reason the Israeli authorities allow a small amount of exports and cash crops from Gaza is to undermine the boycott movement, to say that Israeli companies are exporting Palestinian products, and therefore shouldn’t be boycotted. It’s imperative to think of ways to break restrictions on exporting Palestinian produce without benefiting Israeli companies and the Israeli economy. TC: Even while Israel benefits from Gaza exports, they are effectively boycotting Gaza produce by not giving access to their own markets. That constitutes a boycott by Israel of all Gaza goods. And of course, farmers here have no options. They have to live, and they have to try to export what they can. The people we’ve met have said they have no choice, but agree with the international boycott. The exports allowed now are so small, they don’t really make a difference. In order to actually benefit the Gaza economy, there needs to be some kind of autonomy for Gaza farmers, so they don’t have to rely exclusively on Israel and its companies. JC: You’ve mentioned Israel profiting from the siege several times. Can you say more about that? TA: We’ve already mentioned two areas. One is Palestinian exports, which necessarily have to go through Israeli companies. We’ve also mentioned Israeli arms companies having a market for their products in the continuing aggression against people in Palestine, and a testing ground for products they can sell internationally. The Kerem Shalom crossing is virtually the only point for goods to enter Gaza. The flow of those goods through Israel benefits the Israeli economy. Transport and marketing companies benefit from selling those goods and transporting them through the crossing. Health workers have to buy products from outside. All the health workers’ organizations say they are supportive of the boycott of Israel and boycott Israeli products, except when they need them to protects lives and can’t buy them from anywhere else. However, all the drugs services care providers buy or are provided have to come through Israel, except for small amounts occasionally allowed as aid through the Rafah crossing. Israeli companies benefit in the provision of these drugs, as well as transportation of them. Health workers who need to get equipment into Gaza, when they’re able to bring it, are sometimes required to wait for its delivery while security checks or other arbitrary delays are carried out. In the case of equipment coming from international sources, they’re required to pay for its storage. The Gaza manufacturing industry is damaged by restrictions on the entry of certain raw materials. Again, that increases the necessity of reliance on products from outside, which necessarily have to come through Israel. JC: What’s the state of the BDS movement in Gaza? TC: The movement has a lot of potential. There are people working hard on it, and theacademic boycott seems particularly well-known. I think there’s a clear reason for that. Gaza is very isolated, and students are so often prevented from taking scholarships abroad. There are a lot of young people, including at universities, who have a vague idea what’s been happening with the BDS movement, but want a way to feed into it and work more directly with people on the outside, as well as organizations that have been doing BDS work here. But as we said before, we’ve sensed a lot of enthusiasm, especially from young people, and eagerness to work on BDS. Increased connections among all the people interested in BDS, and with BDS activists in the West Bank and abroad, would be a great next step. TA: I think the role of international campaigners in doing that is to seek the mandate and voices of Palestinians in Gaza in taking BDS actions, to be led by Palestinians in Gaza, and to create better linkages between BDS campaigns and people under siege in Gaza. For instance, the international campaign against the Prawer Plan would benefit from involvement and experience of the refugees here, as the ongoing forced expulsions in theNaqab are simply a continuation of the Nakba, which forced the refugees who now live in Gaza from their homes. The organization which took control of the majority of land after the Nakba, which is instrumental in erasing any trace of the Palestinian history from the sites of forced expulsions, and which is currently planting forests on the lands of Palestinian Bedouin in the Naqab, is the Jewish National Fund. JC: What has surprised you here? TC: Reading about a situation is very different from actually experiencing it. In many ways, experiencing the situation is worse. We’ve come at a time when the border, and issues with fuel and electricity, are very bad. You can sense an increased desperation for a solution. But like the West Bank, there’s the beauty of the place, the beauty of the sea, and the welcome you get from the people, who desperately want this kind of interaction with the world. TA: The thing that struck me was the feeling of isolation, not just from the rest of the world, but from the rest of Palestine. Hearing about friends being tear-gassed by Israeli police in the Naqab, knowing that’s only a few miles away, in places we’ve been earlier this year, but feeling the extreme difficulty of meeting the people involved face to face, shows the isolation of people in Gaza struggling against the occupation. I think the challenge for international solidarity activists is to not accept that isolation. GAZA, (PIC)– The relief committee at the Arab Doctors Union has warned of a health disaster in the Gaza Strip as a result of the worsening humanitarian conditions in the besieged enclave. The committee said in a statement on Saturday that the continued shortage in medicines, medical disposables, and fuel for hospitals was putting the lives of around two million people at stake. It warned that old people, pregnant women, special needs, chronic diseases patients, and children, especially newly born, are prone more than others to be affected by the shortages in the health sector. The health sector in Gaza is worsening especially with the advent of winter and the heavy rainfall and cold spell, the committee said. The ADU urged the Arab governments and civil institutions and all those capable of extending a helping hand to do so the soonest. Health services should be made available to all human beings regardless of any given reasons or motives, it said, adding that no person should be deprived of those services. Legal and ethical responsibility would continue to haunt those who caused all such pain and suffering to the Gaza populace, the ADU committee concluded.